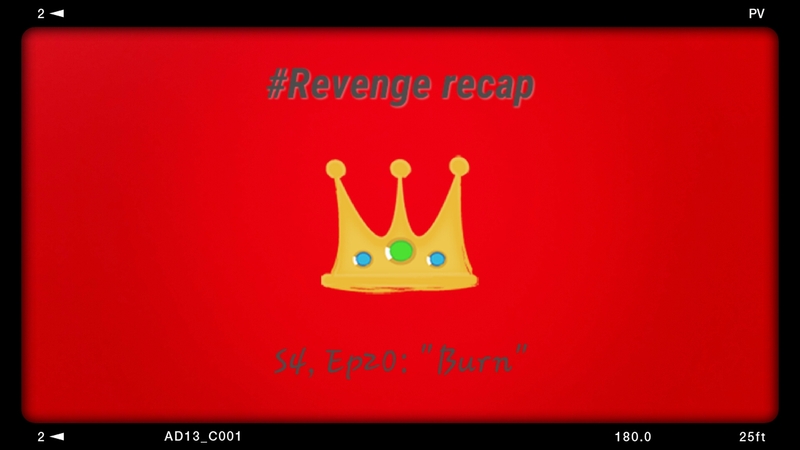 With now only three episodes remaining in this season of REVENGE, my anticipation for the May finale is ablaze with curiosity after last night’s game-changing hour of drama! Now, let’s get down to the business at hand…Victoria’s hand, that is. Have we truly said goodbye to the Queen of the Hamptons?! If our eyes can be believed, than yes. The end sequence (written by Ted Sullivan, directed by Kenneth Fink, and featuring a hauntingly-beautiful score by Fil Eisler) showed Victoria Grayson taking control of the situation and turning Grayson Manor to rubble with the help of an open flue and a lighter. Throughout the episode, Victoria appeared to take the brunt of Emily’s Amanda’s plan of revenge. First, she got a not-so-nice greeting in the parking garage when a masked figure attacked the matriarch and searched her purse for some unknown item. Though she claimed that Emily was the culprit, she seemed too fearful to retaliate by handing over the incriminating flash drive to authorities. Then, Emily adeptly retrieved said flash drive through a plan that involved pickpocketing a FBI agent and impersonating a firefighter. Victoria’s mental state became unhinged as the minutes progressed until she donned a fiery red dress, sat on her throne, and flicked the lighter. She put the power back in her own hands, quite literally. Victoria’s decision and motivation could not have been believed without the sheer talent of Madeleine Stowe. She brought to life a character who was both tormented and strong, brave yet scared, and dedicated to her children. Thank you for an incredible four years of Victoria Grayson! I said this from the beginning of the season, but I’ll say it again: I like Margaux, and I think she’d make an amazing ally for Emily. Two smart, brave, passionate, and determined women fighting for a common cause would be a fierce duo no one should cross. However, I find myself enjoying the Margaux/Louise frenemy dynamic. Neither of these fiery women could agree on how best to protect and support Victoria, which led to loads of snarky comebacks and exchange of power until they finally decided to let their history be just that. With Mama Grayson’s last act, she put into motion events that will pit Margaux and Louise against Amanda Emily. Ultimately, I still want our beloved heroine to outwit, outmaneuver, and outsmart the new tag team, but I’ll enjoy the ride in the meantime. “Don’t go, Jack!” That’s what kept running through my mind as our protagonist rushed to stop the man she loved (but has yet to tell him so) from leaving the Hamptons. After Nolan attempted to convince his best guy friend of Emily/Amanda’s feelings, the two said a heartfelt farewell. *Sidenote: The Nolan/Jack friendship has always been one of my favorites on REVENGE. Kudos to Nick Wechsler and Gabriel Mann for making us love this bromance. * Nolan then booked it directly to his bff’s house, scolding her for not admitting her feelings sooner and prodding her to take action before it’s too late. These two wounded characters hurt one another time and again, sometimes intentionally and other times due to misunderstanding and miscommunication. They’re both struggling to figure out who they are and how they fit into each other’s lives as adults. It’s a beautiful love story, based on friendship and developed over time. As Amanda Clarke faces her past and an uncertain future, she’ll need Jack all the more in the present. I look forward to seeing how it develops in the final 3 episodes of the season. As season four comes to a close, I anticipate a conclusion that will keep me glued to my seat and leave me momentarily speechless! #2 – FRED (Angel, S5 Ep15, “A Hole in the World”): When Joss Whedon kills off one of his characters, it’s not just for the ‘hellmouth’ of it nor is it pretty. The gifted writer/producer/director always introduces us to a wide variety of characters: rebels, villains, and flawed heroes/heroines. Then there were the ones that held them all together: Willow in Buffy the Vampire Slayer, Kaylee in Firefly, and Fred in Angel. Putting any of those three in dangerous situations upped the ante for the rest of the characters and tugged on the viewer’s emotions. Portrayed to perfection by Amy Acker, Winifred ‘Fred’ Burkle became the heart, soul, and innocence of the team. A character full of so much heart, joy, intelligence, and compassion added balance amidst the tormented souls that surrounded her. From the moment she was introduced on the show, Fred’s journey was one we wanted to follow. Over the course of the next three years we watched her come into her own and flourish. So, when Fred died in the arms of the man she loved I wept along with the characters. “No, not Fred. She can’t die,” I thought. “She’s too important.” I didn’t have long to mourn the loss of such a beloved character, because in true Joss fashion, Fred’s death opened a portal (wink, wink) to a new character. Fred’s spirit ceased to exist and Illyria took over, thus, providing Amy a new acting challenge and giving the show added conflict. We lost Fred but still had Amy, and she continued to impress. This TV moment ranks high on my list not only because Fred is one of my favorite TV characters, but because of the episode as a whole. Written and directed by Joss Whedon, “A Hole in the World” paid tribute to a character we all came to love and admire. As her friends rushed to find a way to save her, we felt the fear that they wouldn’t be able to and the disappointment in realizing that they couldn’t. This stunning hour of television remains embedded in my memory due to the talents of those in front of and behind the camera. Dramatic television series can inspire, motivate, educate, and empower. However, they also have the ability to reach us on an emotional level. They do so by creating characters we enjoy watching, and rooting for, only to take them on journeys that make us reflect on our own lives and choices. While I’ve cried many a time during TV shows, there are five TV moments that not only had me sobbing like a baby but impressed me on a creative level. AMANDA CLARKE/EMILY THORNE (Revenge, S2 EP14, “Sacrifice”): When two women, connected through shared juvenile experience, swap identities, neither one’s life is the same. Years after her beloved father is framed for a crime he didn’t commit and ripped from her young life, Amanda Clarke embarks on a plan of retribution. She enlists the help of fellow juvie inmate (Emily Thorne), though their relationship is fractured, and the two start their lives anew. Not always liking one another, or trusting the other, Amanda Clarke and Emily Thorne ultimately formed a familial bond; one that the show’s protagonist came to appreciate as her “sister” lay dying in her arms. The woman who first answered to the name Amanda wept at realizing her long-time friend sacrificed her life for the other’s. When “I’m so sorry” broke out through choked emotion, handled exquisitely by the talented Emily VanCamp, tears ran down my cheeks. The strong, independent, and resilient Emily Thorne cradled her alter ego while I sat on my couch sobbing. I cried because the death affected the main character so tremendously, and I give credit to the writers, to Ms. VanCamp, and her talented co-star (Margarita Levieva) for such a heartfelt moment. Many more emotional/heartbreaking scenes followed in the past two years, but “Amanda’s” death remains at the forefront of great storytelling, acting, and plot twists. One week from today, Revenge returns to my television line-up…thank goodness! Last week I posted two blog entries, one for “Emily/Amanda” and one for “Charlotte.” Who better to round out this creative writing venture with than the matriarch herself – “Victoria”. Representative of the Grayson matriarch’s spitfire personality and protective yet manipulative inclinations, I created a necklace design that’s a blend of royal violets and emerald-green crystals. Dubbed “Queen Victoria” by the show’s writers and fans, I choose a cameo pendant symbolizing elegance, class, and high-society. 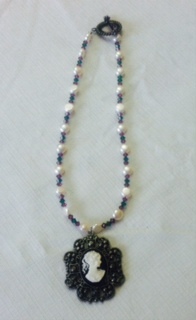 Plus, using a Victorian-style pendant was too perfect to pass up. “Victoria Grayson” rules her world with fervor, determination, and ultimately a belief that she’s protecting her children. Her intentions may be good, but her methods cause mayhem and tragedy. Deep down, despite her faults, I am of the opinion that “Victoria’s” motives stem from envy. Jealousy of those who the love she lost and reflective of the choices she made to get her where she is now. The Revenge writers created a character that you love to hate while also feeling sympathetic to her situation, though self-inflicted. “Victoria’s” portrayer, Madeleine Stowe, excels at bringing forth the complexities of her character. 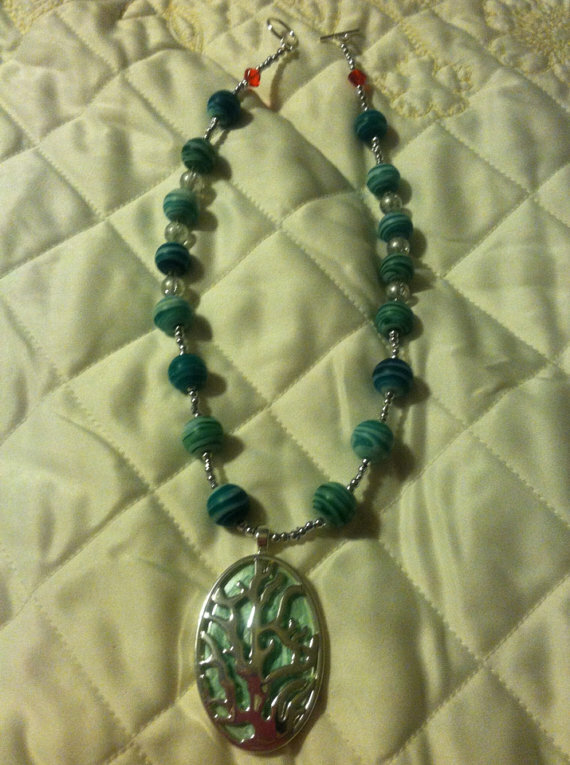 As such, this necklace represents not only “Queen V” but the elegance and talent that Ms. Stowe shares each week. To fill the void until ABC’s Revenge returns on Sunday, December 8th, I’ve merged my love of writing and entertainment with a new-found artistic venture…jewelry-making. Life inspires art, or in this case one artistic interest inspired another. 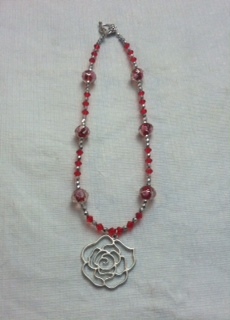 I have created necklaces inspired by three of the female characters on Revenge. First up…”Emily Thorne/Amanda Clarke”. Snatched from her father and the innocent life she led, a young “Amanda Clark” was forever changed in an instant. Driven by fury towards those who wrongly accused her father, a now grown “Emily Thorne” is a shadow of her childhood self. The young woman who returned to the Hamptons has tried desperately to maintain the persona she created so many years prior. Very few know her true identity and fewer still know her true self. As our protagonist fights for justice, she strengthens the walls around her heart. Love in its truest and purest sense is difficult to maintain in the life that “Emily” has chosen. At least, so far that’s been the case. The romantic entanglements intertwine with lies, misunderstandings, and pain. Pain of what was lost and what could never be. Focused in her mission to destroy the Graysons, her actions are purposeful and clever. Both the guilty and innocent have fallen prey to the path “Emily” willingly walks down. With blood on her hands and pain in her heart, she does battle with the scared little girl she left behind in seek of revenge. DISCLAIMER: No endorsement intended or implied! REVENGE: How Sweet It Is! Up until the Primetime Emmy Awards telecast on September 22nd, this blog focused on the returning TV shows I’m most excited are coming back. Time for some…Revenge! I got hooked in Season 1, Episode 1 and have remained entangled in the web of action that sustains this ABC drama series. At its heart, Revenge is more than just the main character’s pursuance of those she holds responsible for her father’s incarceration and death. For as much as “Emily Thorne” (aka “Amanda Clarke”) battles the individuals who wronged her family, she’s simultaneously battling her own demons. This strong, conflicted, determined young woman fights every week to seek retribution, all the while torn by the damage her own actions have caused. This remarkable cast excels at keeping the audience uncertain whether to love or hate their characters. They do so by letting us see the complexity within. The range of acting talent on this TV drama series makes this a program that is truly an ensemble piece. Each and every cast member plays a role (pun intended) in creating characters that walk the line between naive, tortured and just plain malicious. For instance, “Victoria Grayson” made some horrid choices, including letting “David Clarke” take the fall, but the writers gave Madeleine Stowe a canvas on which to paint. And that she’s done! We may not like what her character does, but we understand and sometimes even sympathize with her. On the other side of that tattered coin, there’s “Amanda/Emily”. Portrayed with stunning subtlety by Emily VanCamp, the series’ protagonist has us cheering her on even when her actions mirror that of those she seeks to punish. Ms. VanCamp does this by easily moving in and out of two very different characters. Last season her worlds started to collide and those around her got caught in the crossfire. While a less gifted actress would choose an easier path, Emily handled her character(s) with care – making us not only sympathize with her plight but empathize with her struggles. Case in point, this past season’s episode when the real “Emily Thorne” died in our lead character’s arms, I sobbed. With the words, “Oh my God, I’m so sorry,” my heart broke. All it took was a simple moment. No overacting, no melodrama, no hysterics. Just a heartbreaking performance by a talented actress. That example is just one of many that speaks volumes as to what this TV series is all about – while “Emily” seeks revenge, “Amanda” continues to punish herself just as severely. I don’t know about you, but I can’t wait to find out what sort of situation these characters are in when the new season starts Sunday, 9/29/13 on ABC at 9pm (Eastern Time)!